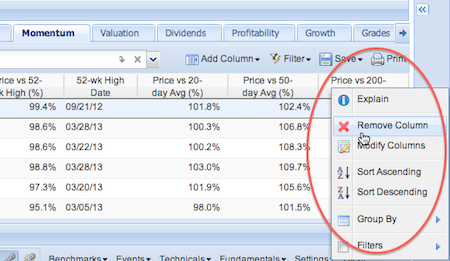 You may know that Stock Rover offers over 250 financial metrics for researching and analyzing securities. Of course, depending on the research questions you’re asking, you probably have just a handful of those you really care about at any given time. So how to cut out the noise and get straight to the information you care about? Easy—using Views. Views are one of our key features that we believe sets Stock Rover apart from other investment research tools, yet they are not well understood by many users. If you haven’t yet created or modified a View, read on. In just a few minutes, you’ll know everything you need to know about this eminently useful feature. We provide a set of factory-standard Views such as Portfolio Performance, Growth, Valuation, and Returns vs. the S&P 500. These standard Views are helpful as they are, but really they are just to get you started on your own collection that you can tailor to your liking. You can modify a View in four ways: adding columns, deleting columns, changing the order of columns, or changing the sorting. In other words, anytime you modify columns in the Table, you are modifying a View.Note that whenever you change something in a View, that change is automatically saved. You can also create a new View from scratch or delete any View you don’t use. Let’s take an existing View and change it. The Momentum tab contains technical indicators of momentum which I like to look at after running certain screeners. Usually the first thing I want to know is what stocks from my screener are closest to their 52-week high. Since a column with this information—the 52-week Range column—is already in this View, all I need to do is to sort it by clicking its column header (in this case, clicking it twice). Now every time I click on the Momentum tab, whatever stocks I am looking at in the Table will instantly get sorted by where they are in their 52-week range. Whatever is closest to its 52-week high will appear at the top. When I’m looking at momentum indicators, I also like to know when the 52-week high was reached. So I’m going to add the column 52-week High Date. I do so by using the ‘Add Column’ searchbox, shown below. When I select 52-wk High Date from the list, it appears in the Table as the left-most numerical column. But to keep things tidy, I prefer to put it with similar metrics, so I drag and drop the column to cluster it with its cousins, 52-week Range and Price vs. 52-week High. There is just one more thing I want to do to perfect my Momentum View. Since I rarely look at the Price vs. 200-day Average metric, I’m going to delete it by right-clicking that column header and selecting ‘Remove Column,’ shown below. And presto! Now my Momentum View is complete: it shows exactly the momentum information I want to see—nothing more, nothing less—and in the order I want to see it. First, as shown in the top red rectangle, I can select the View I want to modify from the drop-down menu. Or I can hit the New View button to build a new View (note that, from this method, the new View will start with columns from the View you were just looking at, but you can change them). 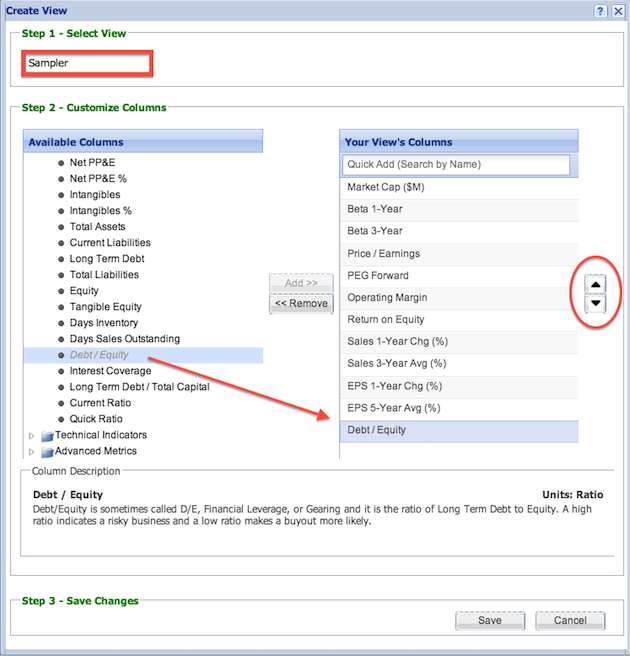 Below that, in ‘Step 2 – Customize Columns,’ I can add or remove columns to my View as I see fit. I can find columns to add either by browsing the folders on the left or by searching the Quick Add box on the right. Everything added to the View will collect in the list on the right. This brings up the View manager again, but the View’s contents are so far empty. For this new View, which I’ll call “Sampler,” I’m going to add a medley of different kinds of metrics I like to look at when just getting started with fundamental research on a company. I pull a few key columns from each of the Valuation, Profitability, Growth, and Balance Sheet categories. I can re-order these columns by moving them up or down in the list using the arrows on right (circled above). Whatever is at the top of the list will appear as the left-most column in the Table. When I click ‘Save,’ Sampler gets added as the right-most tab in my Views bar. If I want to move it into a different position, I right-click it and select ‘move left’ as many times as I need until it is nestled into the spot where I want it. Also notice that from the right-click menu shown above you can hop to any other View (last menu option). By now I hope you feel you have a new friend in Views, and are excited to start customizing your own. If you have further questions, see our How To guide about Views or about the Table, or get in touch with us at support@stockrover.com. 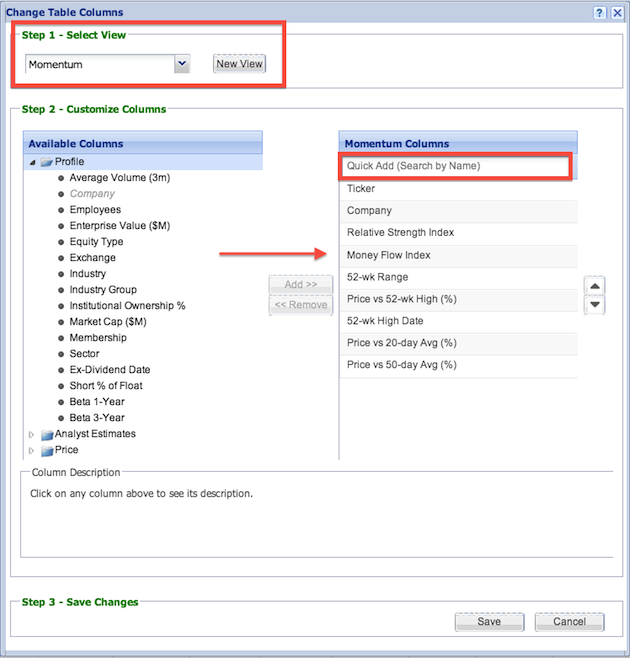 *Columns, sometimes used interchangeably with “metrics,” are the columns in the Table.